Tires come in three basic flavors: summer tires, all-season tires, and snow tires. Cars arriving in Minnesota from warm climates are usually fitted with summer tires. Summer tires are useless and dangerous on snow. If that's what you have, you need new tires as soon as possible. Cars who never leave urban Minnesota need, at the least, all-season tires. These can be worn on the car all year round and provide reasonable grip on ice and snow. 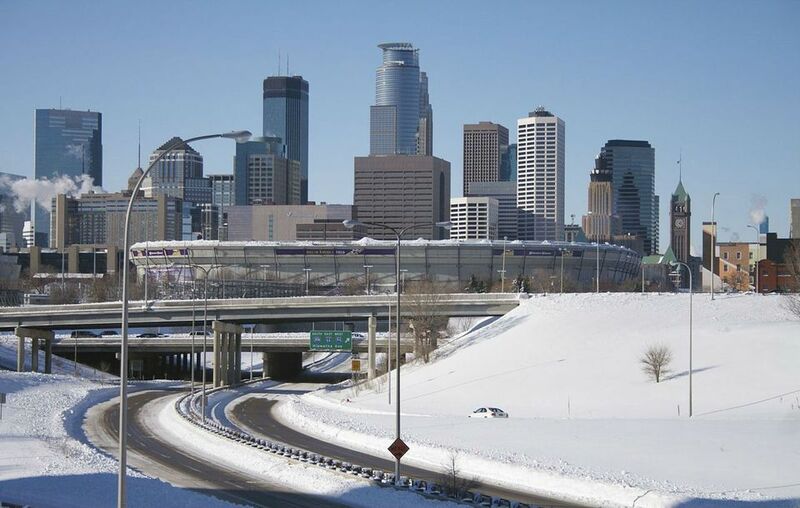 In Minneapolis, St. Paul, and other urban areas, snow is usually plowed often. Even with an average of 50 inches can fall in the winter, it's actually quite unusual to do much driving on snow unless it's snowing heavily as you drive. Neighborhood streets are not plowed as quickly, but all-season tires can generally deal with the kind of slow driving required in a short trip through the neighborhood. A safer and better option, and the only option for cars who drive outside of the main roads, is snow tires. These tires have a better grip on snow and ice. They will need to be replaced with summer or all-weather tires when summer comes, as they will wear out very rapidly when driven on snow-free roads. Ensure that tires have plenty of tread, and check that tires are inflated to the correct tire pressure. What about snow chains and studded tires? Studded tires are illegal in Minnesota because of the damage they cause to the roads. As for snow chains, you may need them in rural areas, but since most roads in Minneapolis, St. Paul, and the surrounding urban area are plowed quickly, it's very unlikely snow chains will be necessary. No antifreeze in your car will mean a huge repair bill if the water in your car's coolant system freezes and breaks any of the pipes. Most garages will check antifreeze levels for free. Many car manufacturers and garages recommend that cars have their radiators flushed and refilled with antifreeze once a year. No car likes being started in the cold. A newer battery, in good condition, is essential to avoid being stranded. Windshield wipers in good condition are vital for visibility when driving in falling snow or sleet. And they are just as vital when driving through the cocktail of slush, salt, grit, and ice-melting chemicals on the roads, all of which end up on the windshield. As well as replacing your windshield wipers, top up the washer fluid. A full tank of washer fluid (anything else will freeze solid) will last about one winter of commuting to work. Usually, a together-in-one tool is available for cheap at stores and gas stations. Get one with a long handle so your hands don't get too cold when clearing snow. You have to clear snow from the roof and hood too, otherwise, when you brake the snow on the roof will fall forward in front of the windshield. And snow on the hood will blow onto the windshield as you drive. The aforementioned slush, sand, grit, and ice-melting chemicals, as well as splattering all over windshields, also accumulates on the underside of cars and accelerates corrosion. The easiest way to keep the underside of the car as rust-free as possible is to have the bottom of the car sprayed at a car wash, once a month. If it's important in regular driving, it's probably even more so in winter driving. The safest car to drive in the snow is a well-maintained one. Follow your car's recommended maintenance schedules and keep brakes, spark plugs, oil, lights, and other essential components in good working order.